Olive oil is touted as the gold standard among all edible oils today; a reputation that has been gained primarily from its association of a lower incidence of heart disease among the Mediterranean populations who have traditionally consumed olive oil as their main dietary fat. The component of interest is the monounsaturated oleic acid content of olive oil, which on average is about 70% of its composition. 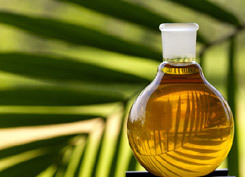 Did you know that despite the lower content of monounsaturated oleic acid in palm olein, the ability of olive oil and palm olein to regulate plasma cholesterol levels in humans is essentially identical. Humans fed diets predominating as either olive oil or palm olein showed identical plasma cholesterol response which augers well for the beneficial effects of these oils against Coronary Heart Disease risk. Ng, K.W.T, Hayes, K.C., Dewitt, G. F., Jegathesan, M., Satgunasingam, N., Ong, A. & Tan, D. (1992). Dietary palmitic and oleic acids exert similar effects on serum cholesterol and lipoprotein profiles in normocholesterolemic men and women. J Am Coll Nutr. 11: 383-90. Choudhury, N., Tan, L. & Truswell, A.S. (1995). Comparison of palmolein and olive oil: effects on plasma lipids and vitamin E in young adults. Am J. Clin Nutr. 61:1043-51. Palm Olein, in showing nutritionally similar result as olive oil is better as it is much more economical.